Well, this should be an interesting month. For the first time ever, not a single recipe for which I voted made the roster. What the heck! Are my tastes really that weird? Probably best not to contemplate that question for too long. Instead, let’s talk about this week’s French Fridays with Dorie recipe, Chicken Breasts Diable. I’ve said it before and I’ll say it again, Dorie knows her chicken. I’ve liked most of the recipes from this chapter of the book and a few have been turned into oft repeated favorites in my house. This week’s offering was an easy main, quick enough to be a weeknight meal. Apparently I’ve been living under a rock or something because I’ve never heard of chicken diable before. In the end it turns out to be a rather self-important name for a simple creamy dijon pan sauce. So, to wrap up: simple, easy, and tasty. Another keeper. Pretty food on a pretty plate! Looks good. Yup, this is a keeper! Beautifully plated…we’ve come a long way, haven’t we? Don’t feel too bad, I’ve been living under the same rock – never heard of it either…. I didn’t think about it… but yes, the recipes that I repeat the most of Dorie’s are the chicken. We’ve made chicken normandy quite a few times… Glad you enjoyed it. You are so right to point out that Dorie really knows her chicken! This was another keeper I agree! Very nice plate, looks like an heirloom. Yes, I agree, another keeper. We loved the mustardy sauce much more than I thought we would…nice surprise. Your meal looks wonderful. Well done. You’re not alone. I’d never heard of chicken diable either. A keeper indeed 🙂 Loved this one. Happy weekend! Right you are, simple, easy and tasty. And although I know I must have eaten this dish before in some form, I had never heard of Chicken Diable either. I study my French pretty hard and I don’t think I even knew diable meant devil. Your entire dinner plate looks delicious. Very pretty. This was an easy, elegant, and tasty dish. Have a great weekend. I was kinda surprised at this one. I’ve heard of a diablo dish before, but it usually involves some real heat. I wasn’t aware that mustard counted as “hot!” but, yes, this is definitely a keeper. Yours looks delish! I think we must have voted similarly – only one of the ones I voted for made it onto the list this month, the cheesy creme brulee. Is that garlicky crumb-coated broccoli that you served with your chicken? It would make a great side for this dish. We really enjoyed this one, too! Your plate really looks great. This one has already been a repeat in my house perhaps a dozen times in the last year alone. Seriously easy to make and update for pork, etc. Very well liked by company as well. Commit it to memory! 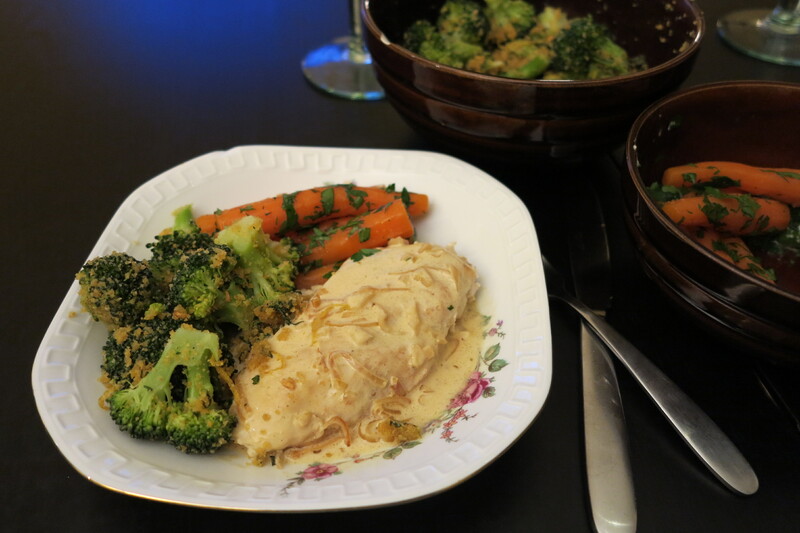 Rose, your “Chicken Breast Diable” looks wonderful with that delicious sauce and I am sure that the broccoli and the carrots were really a great pairing for this chicken dish. Have a lovely early spring weekend! We loved this, too! Nice colorful dinner you served! This was good, wasn’t it. I like your choice of veg. I will have to try to make that broccoli at some point. Your dish looks great!